The St. Jerome Royal Church (or Hieronymus Monastery) is a Roman Catholic church from the early 16th-century in central Madrid, near the Prado Museum. It is late Gothic style with Renaissance influences. The church, which has undergone numerous remodelings and restorations over the centuries is the remaining structure of the Hieronymus monastery that once stood beside the Buen Retiro Palace, of which a portion now serves as the Prado Museum. Its proximity to the palace also underscores a connection to royalty, serving for centuries as the church used for the investitures. In part, This link was cemented also because Madrid only completed its Cathedral of the Almudena in 1993. For many centuries, the Church of San Isidro served as a de facto cathedral, but while this church was associated with the patron saint of Madrid, St. Isidore was also the patron of manual laborers, not royalty, thereby relegating the role of royal chapel to this church. Henry IV of Castile ordered build a first monastery for the hieronymites friars near the Manzanares River, during his reign (XV century). But, at the beginning of XVI, the Catholic Monarchs ordered the construction of a new Monastery of the Hieronymites in the current location, near what was then the incipient royal palace. The new monastery was built in Isabelline Gothic style. Philip II moved the court to Madrid in 1561, and had the retreat enlarged to become the palace of Buen Retiro. He established a royal bedroom against the presbitery, such that he could hear mass from his bedroom. The palace of Buen Retiro was largely destroyed in the Napoleonic occupation of Madrid (1807–1814). In 1808 the monks were expelled and French troops were quartered in the monastery. The war caused major damage to the building, and the church was almost left in ruins. Years later, Francisco de Asís, consort of Isabella II, ordered the restoration of the church. Of then are the two towers of the header. 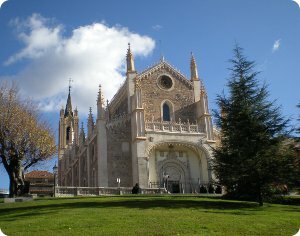 The church contains sculptures by Benlliure, Juan Pascual de Mena's (18th-century), and paintings by Vincenzo Carducci and José Méndez, neo-Gothic lamps and stained-glass windows. Monday to Saturday: 10:00 to 13:00 and 17:00 to 20:30. Sunday: 9:30 to 14:30 and 17:30 to 20:30. * Line 1 - Atocha station.